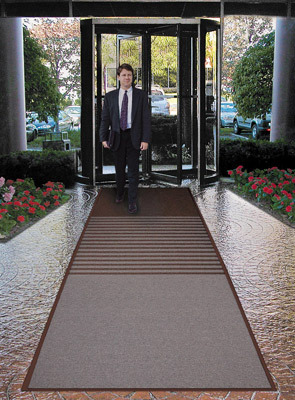 The Opera™ entrance mat system combines 3 functional mats into 1 mat design. Zone 1: A looped non-absorbent yarn to scrape debris and moisture from foot traffic. Zone 2: Combines looped scraper yarns with absorbent Decalon® looped pile to begin the drying process. Zone 3: Pure Decalon® looped pile to complete the drying function. All yarns are color-coordinated to combine beauty and functionality. Opera™ is perfectly suited for all large upscale entrances including offices, hotels, and professional office buildings. The first 3 to 4 feet of the mat (depending on length of mat) features a looped non-absorbent yarn to scrape debris and moisture from foot traffic. The second 3 to 4 feet of the mat combines the looped scraper yarns with absorbent Decalon® looped pile to begin the drying function. The final 3 to 4 feet of the mat is pure Decalon® looped pile to complete the drying function. All yarns are color-coordinated to combine beauty with functionality. A dense combination of yarns ensure maximum performance. A heavyweight vinyl non-slip backing ensures minimum movement. When ordering custom sizes please indicate required length of each mat / strip in inches; and number of mats / strips desired in the quantity box. Sold by the Lineal Foot; price is based on the sum of the total length of all mats / strips ordered, rounded up to the nearest foot.